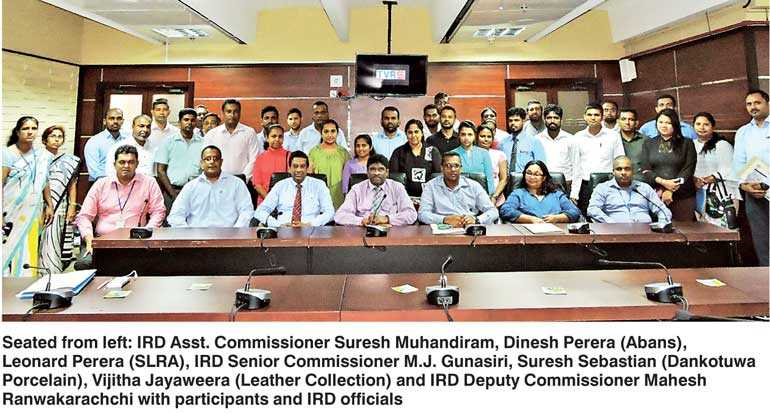 The Sri Lanka Retailers’ Association (SLRA) member company representatives recently participated in an awareness program conducted by the officials of the RAMIS Project Office of Inland Revenue Department (IRD) to educate and promote implementation of the ‘Tourist VAT Refund Scheme’ (TVRS) at the at the Bandaranaike International Airport (BIA). TVRS will be launched initially as a pilot project by IRD on a manual system and will be graduated to a fully automated RAMIS system operated by IRD connecting on-line with authorised retailers in future. New Tourist VAT Refund Scheme (TVRS) is introduced by Inland Revenue Department under section 58A of the Value Added Tax Act, No. 14 of 2002 (Amended by Act) and implemented by Gazette notifications of Commissioner General of Inland Revenue and Minister of Finance accordingly. Foreign tourists who purchase specified goods exceeding Rs. 50,000 exclusive of VAT from authorised retailer outlets in Sri Lanka are eligible to claim VAT refund at the airport as per applicable terms and conditions of the TVRS system. Eligible tourists can claim VAT refund by presenting the TVRS Tax invoice for specified goods purchased to the Custom Officer at TVRS counter and thereafter on approval encash TVRS Voucher in US dollars from the Bank of Ceylon (BOC) Transit branch at the airport; as quoted in the presentation by the Inland Revenue officials. SLRA Members comprising representatives from Abans, Avirate, Cool Planet, Cool Kidz, Cotton Collection, Damro, Dankotuwa Porcelain, Exclusive Lines, Hameedia, Leather Collection ,No Limit, Odel, Softolgic, Shirtworks, The Factory Outlet and Thilakawardene Textiles attended this awareness program presentation presided by M/s M.J. Gunasiri (Senior Commissioner), Mahesh Ranawakarachchi (Deputy Commissioner) and Suresh Muhandiram (Asst. Commissioner) working on the TVRS implementation initially on a pilot manual system from the Inland Revenue Dept. connecting with the authorised retailer outlets and TVRS Counter at the Bandaranaike International Airport (BIA).